friends are tired of hearing me praise it, and so is my family. A few buddies of mine even downright dislike the notion of this game, they don’t get what there’s to ‘get’ about it – ‘oh, a walking simulator peppered with brain-teasers… ugh’. So I thought I’d try to officially lay down once and for all everything that makes me deem The Witness so brilliant, why I think there’s way more to it than most people understand, and why I feel it will be studied in the future as something of a ‘meta-game’ – an authentic artwork that transcends the boundaries of its own medium and exceeds its condition. True Art is meant to transcend, to rise above merely being a product of its time, place, culture, medium, genre. But, like in all such cases, only posterity will tell. Quite a daunting task I’ve set upon myself, because The Witness is hard as hell to talk about and analyze, and its aims even more elusive to dissect and expose. It’s like a mystical or psychedelic experience – one can’t successfully verbalize that which occurs in a realm much superior to where language is formed. And it’s no accident that I invoke the ‘mystical experience’, because I really intuit that is indeed what the auteur, Jonathan Blow, alludes to with his creation. original puzzles by elucidating logical premises made up of the game’s own visual language. visual and symbolic. The game is about you learning, about you becoming wise to its language, and wise in general, through the gradual refining of your intuition and lateral thinking that the exquisite puzzle ideas so subtly subject you to. anything other than consciousness expansion? Isn’t learning all about our awareness increasing in scope? minutes before seemed wholly unsolvable, and with no foreseeable chance of it ever being solved. This game constantly has you achieving the ‘impossible’, or rather what moments before you yourself deemed impossible. I claim that serves as a measure for how your consciousness is gradually being raised. Adding to my list of bold affirmations about the game, I’d dare say the only way to progress in The Witness is through one’s own cognitive evolution. And this makes cheating futile. It’s the only game I’ve played where making use of cheats and spoilers would truly be nonsensical – because you only progress once you’ve ‘understood’, and there is no other way around it. You have to have an ‘A-ha!’ moment for each progression you make. And that is the object of this game – it deals in inducing epiphanies. It is a study of ‘revelation’ as a means to learning. It facilitates and provokes repeated cognitive expansions in the player. Little by little, the puzzles grow to become more than you thought they were. The border between them and the surrounding game-world appears more and more blurred, then illusory, then you realize there is no border – the inner and outer world are One. This is a spiritual reflection if I’ve ever seen one. The game is trying to tell us something. stand out from the rest by how complicated they seem. Once we master the game’s concepts well enough we can more or less with ease open those doors, and inside find unique visual patterns. Patterns that we can introduce like a code at a specific location within the game (a projection room). Turns out all these patterns unlock video excerpts from various already existing media: documentaries, lectures, films. I won’t completely spoil what these videos show, but I’ll say some of them speak on the relationship between science and spirituality, and a couple of feature lectures from two Neo-Advaita spiritual teachers. Now we really start to get the hint about the inner and the external worlds being one and the same. We start to get it, because our consciousness has been raised and expanded by the game. A theory I have is that while we are captivated and distracted by the puzzles, our minds meditate, and the resulting epiphanies and increases in awareness are owed to that very process. Before someone discards it as an outlandish theory, I would explain that the essence of meditation is silencing the mind. 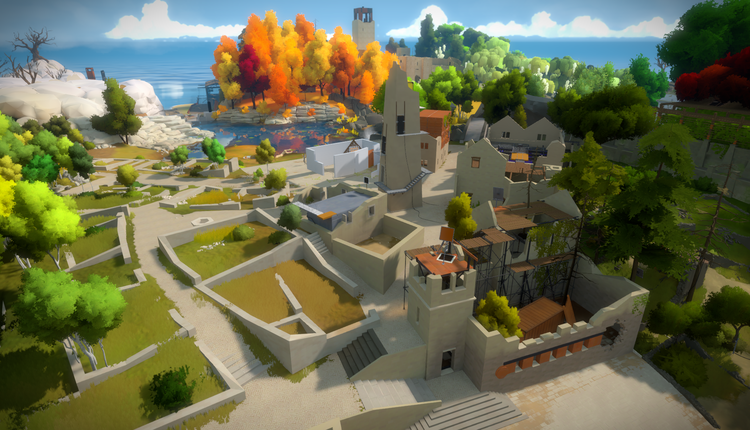 The Witness has dozens of puzzles scattered across its beautiful, isolated world. Source. In Yoga, for example, the mind gets silenced through breath-focus or through the sheer concentration required to assume and maintain certain asanas (poses). To me, The Witness with its puzzles is very similar to Yoga in that respect and, in my estimation, conducive to spiritual realization. The game actively teaches meditation. In the aforementioned Indian philosophy, the concept of ‘Witness’ (Sakshi in Sanskrit) refers to ‘Pure Awareness’, and its real nature is ‘Atman’ (‘the unchangeable eternal Reality’). This finding alone confirms my intuitions and hints at how Jonathan Blow really meant to create something of this very nature, and succeeded. Nothing was left to chance in his creation, which is a work of genius and of great artistic and philosophical value. The Witness fittingly ends with a short recitation from the Diamond Sutra, the oldest dated printed book in the world and one of the most influential Buddhist texts – bearing ‘diamond’ in the name to allude to a ‘diamond cutting through illusion’. Every verse of it has afferent locales present within the game-world.